The smaller screen you can take anywhere. After a rather sluggish start, broadcasters have finally come around to the idea of letting people watch their TV online and through their phones, and we're here to help you make sense of all the different options out there - specifically for watching television in the UK. First of all a note on TV licences: if you watch any kind of live TV on your phone, you need a licence. If you watch any kind of BBC programme, whether live or via catch-up on an app, you need a TV licence. And of course, if you watch live TV through a TV, you need one too. The only time you can get away without buying a TV licence is if you stick to on-demand, catch-up watching for non-BBC programmes (the actual device you use is irrelevant). A single licence covers all the TVs and other devices owned by the people a single property. 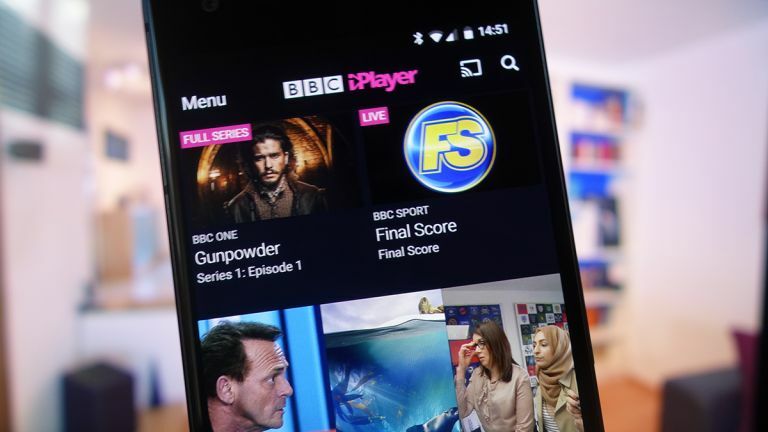 The BBC has been blazing a trail for online and mobile watching for years now, and the iPlayer for Android and iOS is just about the best app of its kind out there. Sign in and you can get recommendations, auto-play the next episode, save shows, and more besides. Crucially, it's rock solid too, and not as susceptible to crashes and lag as some other video streaming apps out there. You can tune into BBC channels live, catch up on programmes that have already aired, and download content for watching without any internet access. ITV's answer to the iPlayer is called the ITV Hub and is available for Android and iOS. As with the BBC app, you can tune into live streams of any channel, as well as catch up on shows you've missed. Everything is neatly laid out and easy to access through the app. What you don't get, without an extra £3.99 payment, is downloads - as well as letting you store shows offline, that one-off fee for Hub+ removes the ads from the app, so if you watch a lot of ITV content on your phone, you might consider the payment worth it. Not to be left out, Channel 4 and its associated channels have All 4 for Android and iOS. You get access to a whole host of older, classic content from the broadcaster, as well as recent shows, and it's also possible to tune into any of the supported channels live. Downloads are available, if you're going abroad or spending a significant amount of time without internet access, and like the other apps here you can stream over Wi-Fi or a (fast) mobile signal. Again, everything is neatly laid out and straightforward to find in the app. Finally for the terrestrial, Freeview channels there's My5 for Android and iOS. The drill is mostly the same as before - catch up on the shows you've missed, access box sets from Channel 5 days of old - but in this case there's no option to tune into Channel 5 live. Unfortunately the app seems to be prone to the odd crash at the moment, as well as being overloaded with adverts, so it's really only for the Channel 5 loyalists. By the time you read this, the developers may have been able to learn something from the other apps here. Covering a lot of the other channels you get with Freeview, like Dave and Yesterday, is UKTV Play for Android and iOS. You can't tune into these channels live through your phone, but you can catch up on shows that have just aired with the minimum of trouble. What's more, some programmes are previewed in advance through the app for up to a week before they appear on the box, so keep your eyes on announcements in the app for details. In all you've got access to thousands of hours of top-quality television content. Sky's app offerings are a little bit of a mess at the moment: if you subscribe to Sky, you can use both Sky Go (Android, iOS) and Sky Q (Android, iOS) to watch TV, but they work slightly differently, and it can be confusing trying to work out which one you need to get installed. Sky Go is the older app and still a very capable one - you can tune into any of the channels you subscribe to live, view movies and sports (if you have those packages), stream shows on-demand if you've missed the broadcast, dig through box sets of shows, and more. The newer Sky Q is a companion app to the premium Sky Q service Sky is rolling out to its customers: you need a Sky Q box at home, and the app needs to connect to it on your home network to transfer recordings. It also supports live and on-demand TV anywhere. Right now Sky is a little bit in limbo between its two apps and its two package tiers, but everything will shift to Sky Q in the near future. For now, you might need one or both installed depending on what you're trying to do and the packages you're signed up for. If you're a Virgin cable subscriber, meanwhile, then you've got Virgin TV Anywhere for Android and iOS to make use of. It can connect to your box to manage your recordings, as well as tune into content while you're on the go, whether live TV or shows on demand. There is one caveat, in that you need a Wi-Fi connection to make use of most of the app's services, so you can't watch programmes over 3G or 4G connections. As long as you're able to get on a Wi-Fi network though, it's the perfect companion to your Virgin subscription. BT has two apps: first BT TV for Android and iOS, which works alongside your BT TV box to bring you a whole host of content, whether live or on demand. There's a Continue Watching feature too, that lets you carry on with a show you started watching on your box. That's for BT TV subscribers, as is BT Sport for Android and iOS, which can also be used if you've subscribed to BT Sport on another platform (like Sky Q). The focus is on the sports channels - they can all be live streamed, and some are available on catch up as well.